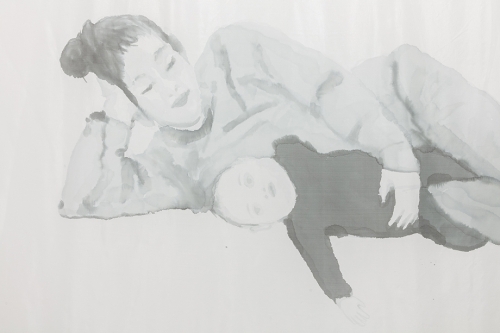 Jack Hanley Gallery is hosting ELIZABETH JAEGER’s “Hours,” in New York. The exhibition is on view through February 10, 2019. “The exhibition draws on a very intriguing thought, the ‘Hours’ spent in the making of an image, especially that of a portrait, in which the sitters have to have long hours of patience in order to get their expressions drawn. They have to hold their hours and seem absolutely one with a single moment, the moment they are about to be immortalized,” the gallery says. Another sitter of ELIZABETH JAEGER explains her experience with the artist. “To pose for an artist is an act of surrender, like falling asleep in someone’s arms. Under the artist’s silent gaze, you become aware of their gradual transformation of your physical self into a flat image that becomes a kind of imprint of their sustained observation,” says Chrissie. ELIZABETH JAEGER’s “Hours” is on view through February 10, 2019, at Jack Hanley Gallery, 327 Broome Street, New York, NY 10002.